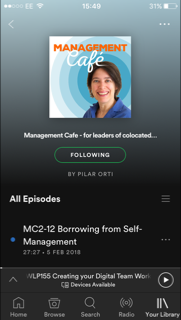 00: 30 Pilar has some updates, including the live online virtual coffee with Phil Montero and Lisette, next week on Virtual Team Leader: Boss or Facilitator? 11:30 Pilar talks about two people she's met recently who energised her. 14:40 What are agile retrospectives? (the basics) How they're different to away-days or staff meetings. 22: 30 "As soon as one person is remote, the team is remote." Practical considerations for succesful virtual retrospectives. 24:25 The use of the sticky board: what's going well, what could be better, questions, suggestions. The importance of language in processes. Luke Hohmann: Co-located teams talk first and then swarm to the whiteboard later; virtual teams swarm first, then talk about it. Sticky boards mentioned: Linoit, Ideaboardz, Groupmap, Google Docs Template. Taking responsibility of the team process. 31: 05 (1) Have an organiser (best if it rotates). 33:05 (2) Don't go on too long and risk "virtual fatigue". How do people get to the point where they can speak out? How do we lay down the foundations for successful retrospectives? The importance of having them regularly. 41:40 (4) Try new sticky notes. (5) Try new types of retrospectives. Luis Gonçalves' "Agile Retrospectives". The importance of play. 48:15 (8) Capture the conversations and actions. What do we do about those things that keep coming up? Newer PostWLP20 Virtual Team Leader: Boss or Facilitator?